This is a hand painted, one of a kind wooden pin. Every worm-hole, irregularity, crack and scratch has been retained as a guarantee of it's uniqueness. Approx 9 cm. Painted with non toxic acrylic colours and natural wax. Meet Thurston. He enjoys making pillow covers and likes to be called Thor. 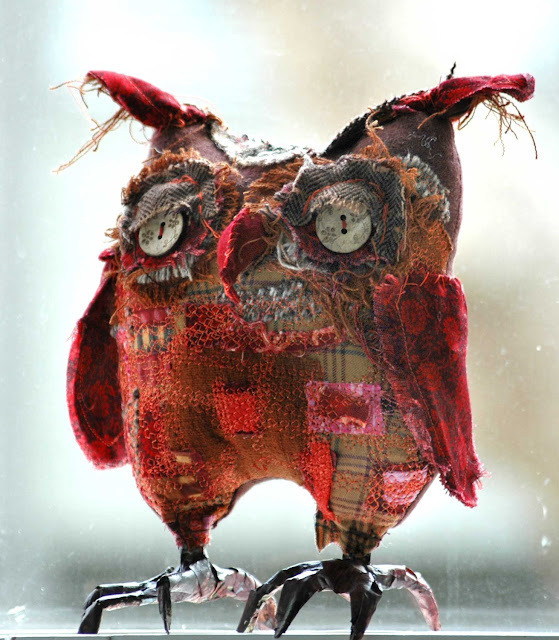 A glorious One-of-a-Kind owl made with scraps from Lori's studio floor. Thor is created using thousands of hand and machine stitches. Made from: • Washed New Wool • Vintage Wool • Vintage Velvet • Wire • Linen • Cotton • Coconut buttons • Polyfiber fill • Vintage Maps (for feet, paper mache, painted and stained). Handcrafted with lots of love (& humour). Thor stands approx. 6" tall. 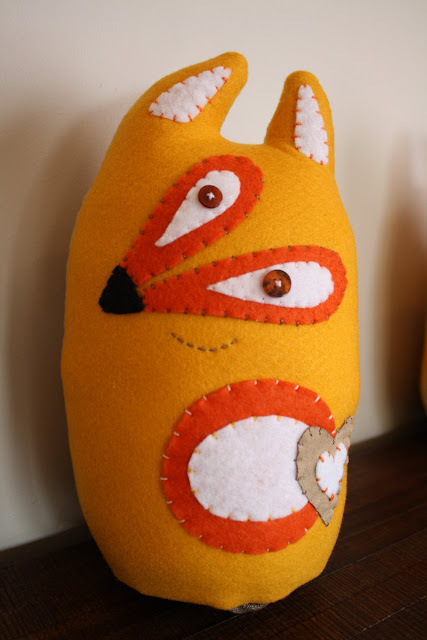 Fibi the Fox is part of the BOO!beloobie range of animals. She stands 10" tall to the tip of her ears (Approx: 26 cm) and 17" around the bulkiest part of her waist (Approx: 44 cm). Her colour scheme is cream, white, orange and yellow, with back nose and she's made from a combination of felt, suede and buttons. Filled with a non-collapsible ball fibre and a small sugar bean bag in the bottom for stability. Available in other colour palettes upon request! 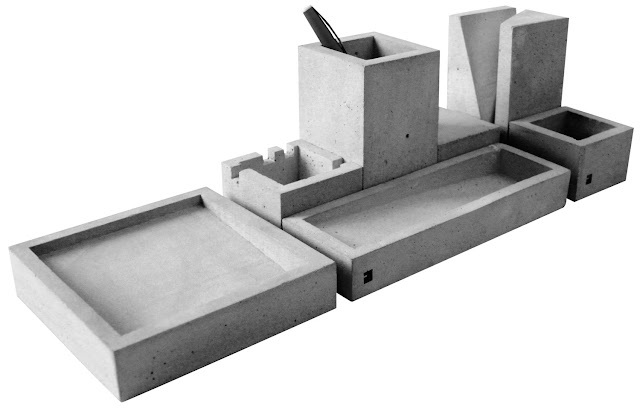 Made from cast concrete, this fantastically functional square desk set consists of a bowl, a paperweight, a pencil tray, a pencil cup, a small bowl, a letter holder and an ashtray. A felt patch on the bottom of each item will protect your desk. The pencil tray and the bowl have a sloping surface, enabling easy access to you pens. Wow! 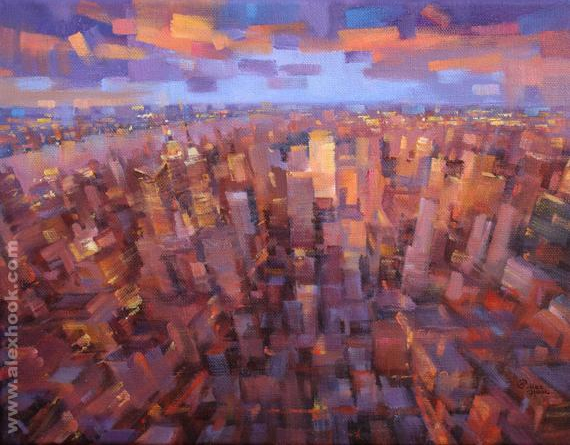 I absolutely love this beautiful painting of New York by Alex Hook Krioutchkov. Absolutely stunning use of colour. One of a kind, signed oil on canvas. Size: 146cm x 114cm. Beautiful! These fantastic silver circle earrings come all the way from Barcelona. 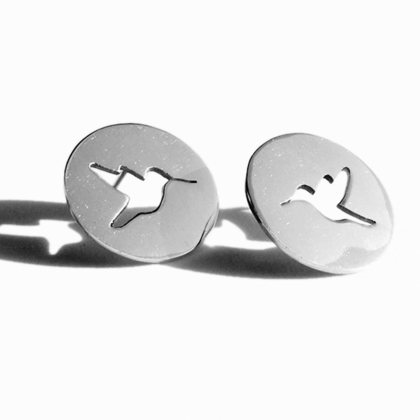 I love the tiny hummingbird design that has been cut from the tiny metal studs. Strangely simple yet intricate, and ideal for summer. Beautiful! 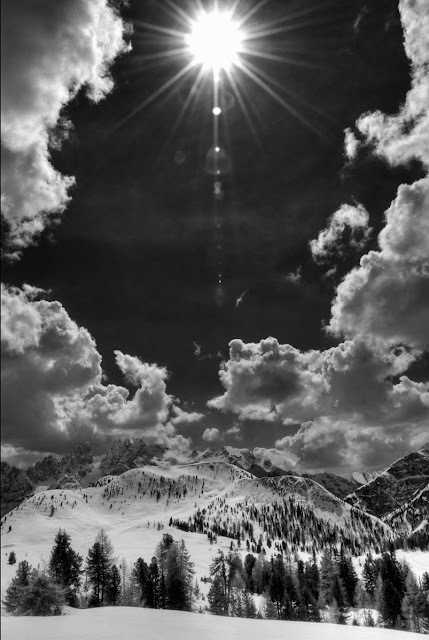 Up between the Dolomites, the world can be beautiful in white and black, just leaving the light to tell us what we see. Dolomites – Alps – Italy. This beautiful print is professionally printed on high quality paper. Size: 8 x 10in / 20 x 30cm. We'd like to propose a toast to those with woodsome hearts! May all your plans of forested bliss be thick with peeping fern, dewy beds of leaves, and low and airy whispers…and…these Sugar Ferns and Fiddle Heads, of course! Beautiful fully edible, and very tasty little works of sugar! 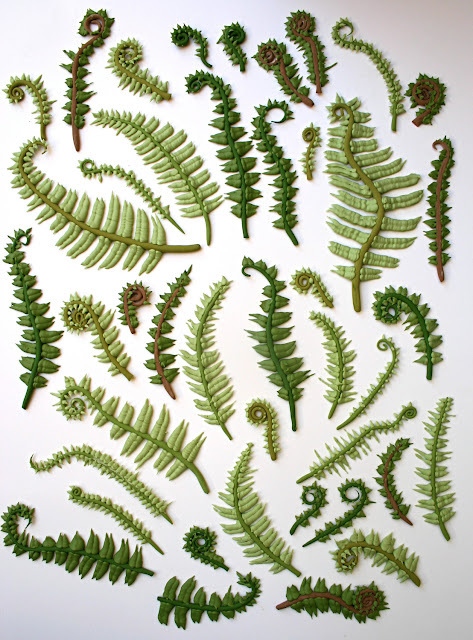 Each Pure Vanilla and real Chocolate infused Fern and Fiddle Head is sculpted by hand, and meticulously detailed. Containing no wires, they are fully edible and can serve as a delightful garnish alongside a piece of cake. They are rigid, will not melt in heat and easy to adhere. Each order comes with guidelines for successful cake decorating! 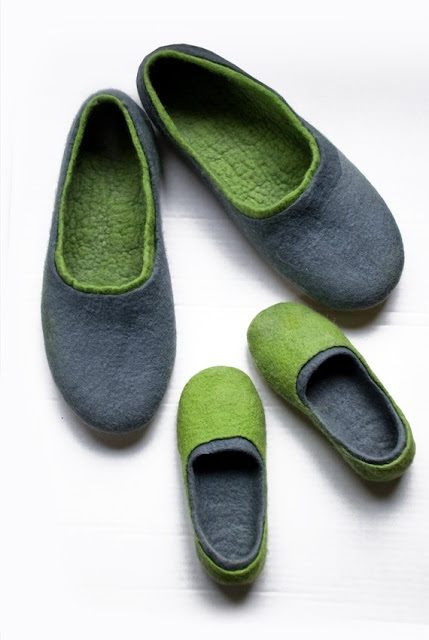 Handmade felted family slippers set (2 pairs) made from softest merino wool. Great gift for fathers day, birthday, anniversary. Available in all kid's and men's sizes. 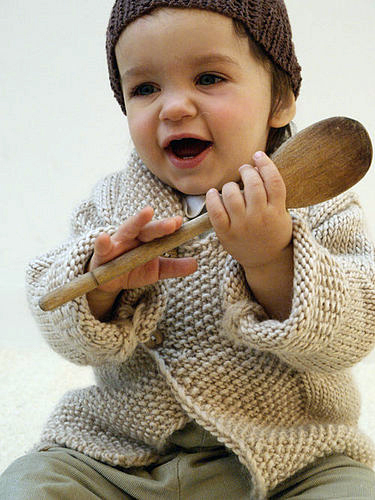 Made of softest merino (australia) wool, they gently massage feet. Warm feeling on a cold day and cool on a hot day due to insulation properties of the wool fibers. 100% handmade. Felt is a natural and renewable material, made of wool, using just hot water and soap – one of the purest processes in textile making. "Layers of slip and glaze are chosen to celebrate different aspects of the form and function of tower blocks and their relationship with the British public. 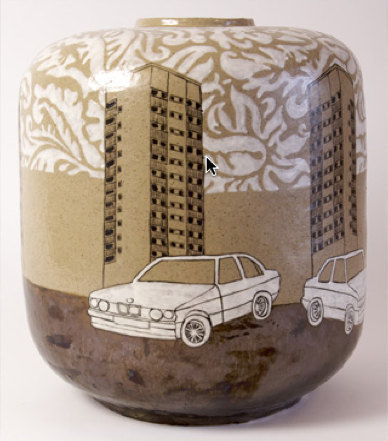 The stoneware forming the structure of the vessels is deliberately left visible to acknowledge the concrete of the tower blocks functional, brutalist exterior. The slip decoration depicts the chintz patterns often chosen by residents to personalise the interiors. A sentimental reminiscence of a cultural style clash pertinent to a period of history that, as their demolition continues to attract large and enthusiastic crowds, is about to be permanently lost. The final drawing in oxide or underglaze transposes the linear outline of the structure of the building in a style that is deliberately naïve – a pedestrian understanding of an intimidating building containing social and political aspirations. Souvenirs of a very British relationship with post war architecture." Beautiful and simple design wins the day! This incredibly functional and durable leather tote is an excellent size to store and organise any room in your home. Made from top grain leather, this tote is intricately folded so that no fasteners are needed. 16" wide x 11.5" deep x 10" high, large enough to store kindling, magazines or books. Beautiful! 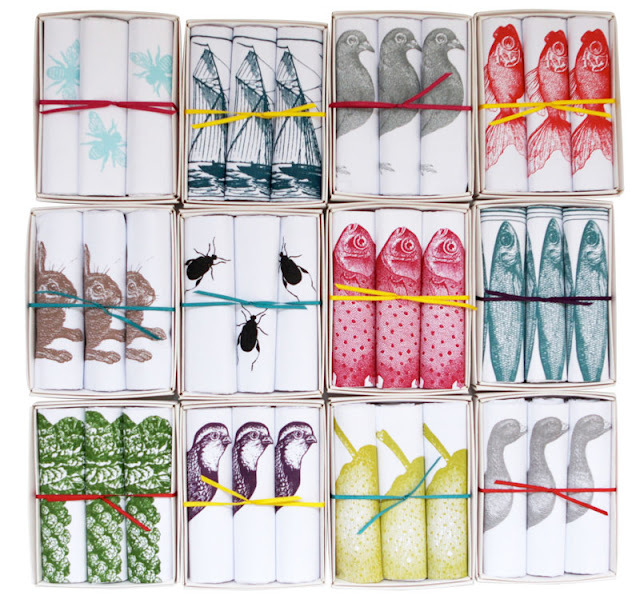 I'm loving these new hanky designs from the very fantastic Thornback & Peel. Three beautifully hand printed 100% cotton handkerchiefs in a white gift box, tied with ribbon. There are loads of designs to choose from, but the scarlet goldfish (top right) are doing it for me at the moment – very nice indeed! 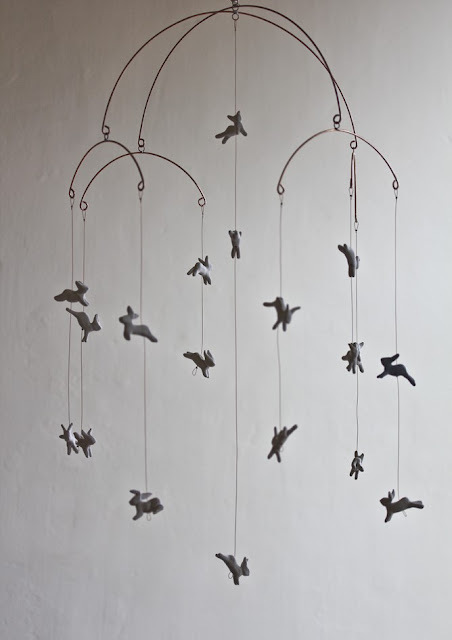 Copper arches suspend 19 leaping rabbit forms, made of pure white clay, on this magical art mobile. 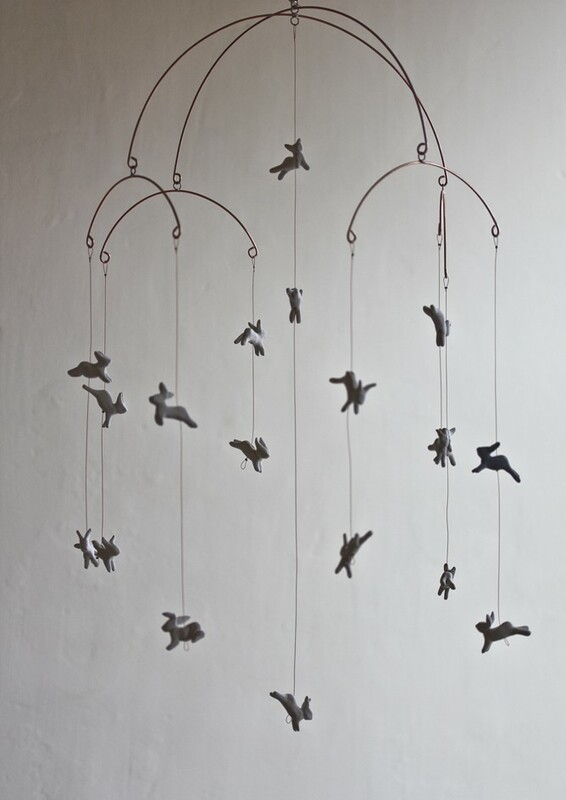 Each rabbit was individually hand sculpted and strung onto a thin copper wire that supports each one's jumps, twists and playful dances. Their personalities come to life when the mobile moves, and their little bodies really do seem to leap about, each one's ears pointing in a different direction. The materials and craftsmanship in this fine art mobile are meant to last a lifetime and be passed on to generations to come. Stunning! 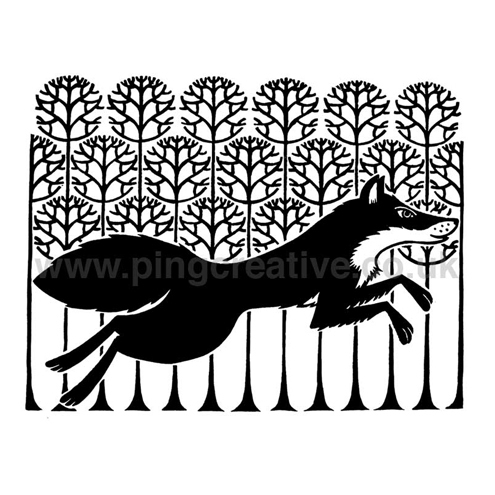 Handpulled fox linoprint printed on lightfast Heritage Elephant 315gsm paper. Printed with Hawthorne oil based ink using a converted flatbed mangle. Beautiful! 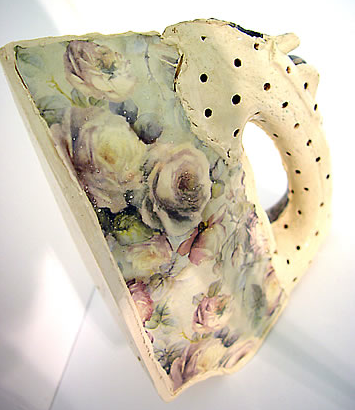 I recently saw Emily's fantastic ceramics at the Holmfirth Art Market, and couldn't resist featuring one of her beautiful and very unusual pieces – this amazing chintz iron. Here's what Emily says about her work: "Growing up around my Grandma’s house I have always been intrigued by the mountains of objects, from kitchen appliances to magazines, which fill the house from top to bottom. Everything is kept, whether it works or not, just on the off chance that it may become useful again. Over the years these objects almost started to merge with the very walls of the house, becoming embedded in their environment, and absorbing their surroundings. Each object has its own history and holds memories of the situations they have been in and the people who have used them. My work aims to be a celebration of these objects bringing together imagery and surface textures, inspired by their surroundings. 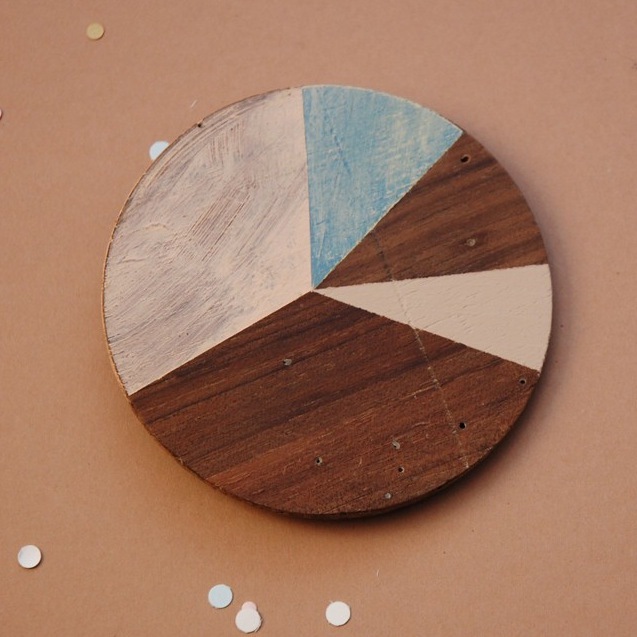 The objects absorb and reflect these elements for the viewer to see. Each piece invokes personal memories and nostalgia. By producing these objects in clay I have given them a longevity not experienced in their real state." June 14th is H. G. Wells’ birthday and in his honor it is also International Steampunk Day (and has been for several years). Today's the day to celebrate everything with a steampunk twist, and there's lots to choose from! I like the simplicity of this sleek and stylish ring from Industrial Radical on Folksy, which features a long, oval shaped watch movement on an adjustable gold-plated base. Elegant, but very eye-catching and unusual. Length: 24mm. Width: 15mm. 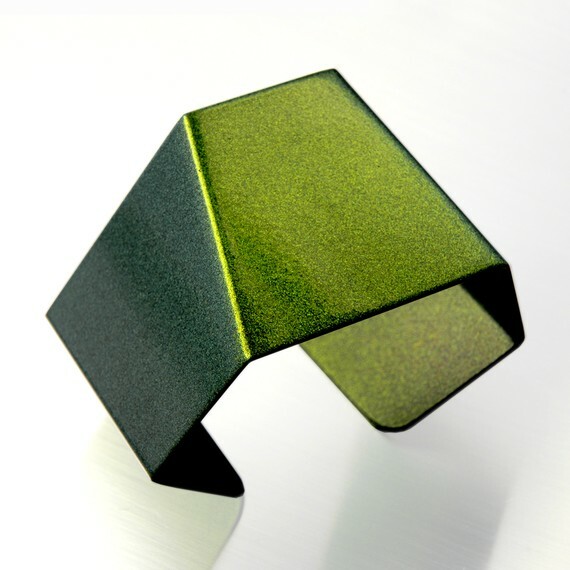 2021 is a futuristic, minimal, spectacular handmade bracelet. It's a one of a kind piece, made of aluminum, painted with three layers of a special metallic car paint, and oven-burnt with an industrial process. It's a unique paint that changes from green to gold depending from the angle of the light. The result is a unusual, glossy and charming color. 4.5 cm (1.8") wide with Arosha's logo signature in sterling silver on the reverse. 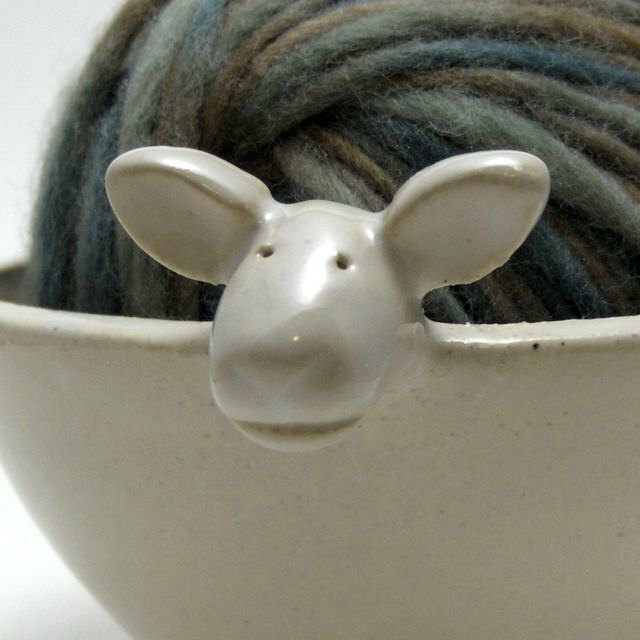 This lamb-inspired bowl is made to hold your yarn while you knit or crochet. The bowl was thrown on the pottery wheel with a white stoneware clay. It has two different guides to hold your yarn, and some sturdy feet to give it weight so it won't tip over. It is glazed in a soft eggshell glaze that gets brown speckles. It's pictured holding a ball of 168 yards of wool yarn. Approximate dimensions: from head to tail- 6 1/2" / from side to side- 5 1/2" / from feet to ears- 3 1/2". Click through for more pics! Limited Edition – only 1 available. 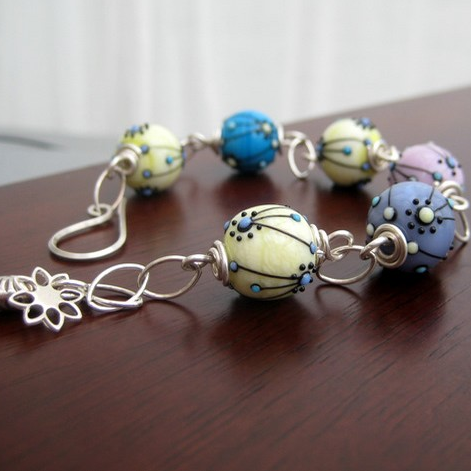 Absolutely gorgeous lampwork glass beads by the very talented Mindy McGregor feature in this bracelet…the beads have an almost retro feel to them in wonderful soft shades of buttermilk, soft pink, turquoise and indigo, each of these beads is a little work of art, each embelished with lines dots and daisy's. Each beaded link is joined to the next with navette shaped sterling silver rings and is finished with a handmade sterling silver shepherds crook clasp and an extension chain with a Bali silver leaf and sterling silver daisy charm. The bracelet measure 21cm in length with a further 3cm extension. 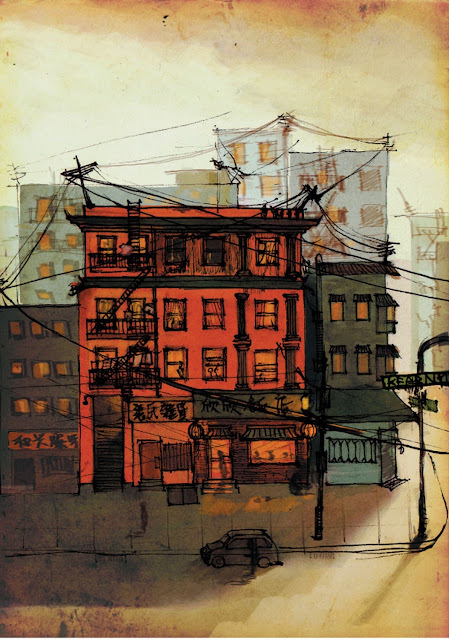 "It was a peaceful chinatown at the evening, when all the people got off from work and enjoying their dinner with their family. I definitely miss those time that I could eat with my family. Don't you?" 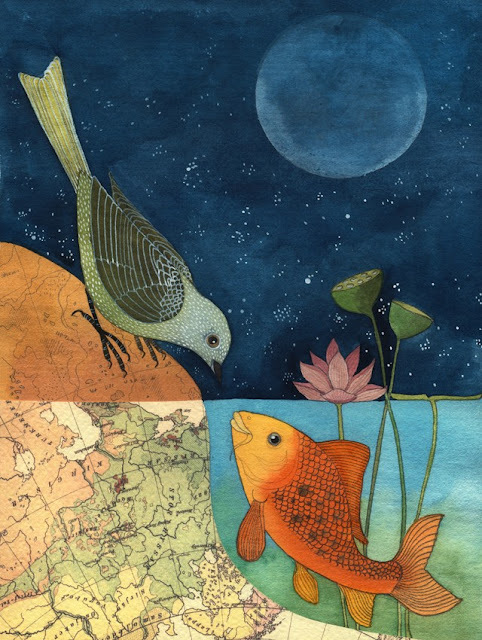 This charming 8x10" giclée is by Aggie Cheung and is printed on Epson Velvet Fine Art Paper with a thick white border for framing. Signed and numbered by the artist. 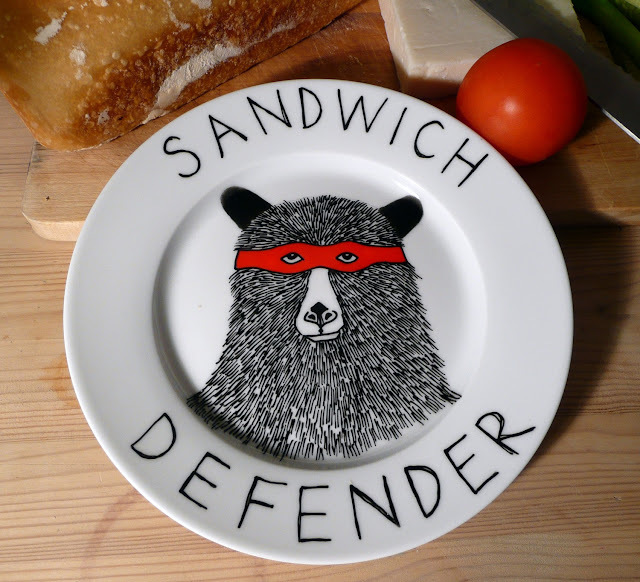 Every family should have a sandwich defender. In bear circles they are a necessity! Original artwork done by Jimbobart, directly drawn on to a side plate using specific on-glaze ink. Each design is hand drawn and therefore completely unique. Love it! 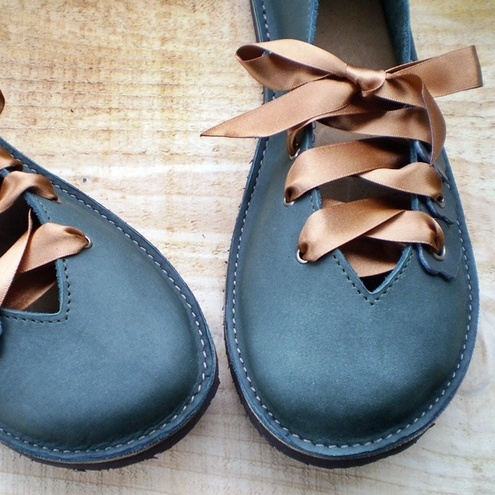 Quince…a pretty retro vintage style shoe made in thyme eco tanned leather with a low cut front, flowers and ribbon laced detail. Contrasting red leather insole. Handmade shoes from start to finish. Made carefully, prudently, exquisitely...where will they take you? UK size 6 / US 8 / European 39. Featured in Vogue and The Green Parent Magazines, this luxurious coat is hand knitted from rugged luxurious yarn which is a versatile mix of 80% merino wool and 20% kid mohair. It’s soft, warm and comfortable. It will keep your princes warm and posh in winter and chill summer evenings. Design features moss pattern and has 8 beautiful wooden buttons. It comes in two colors: frost and shale. 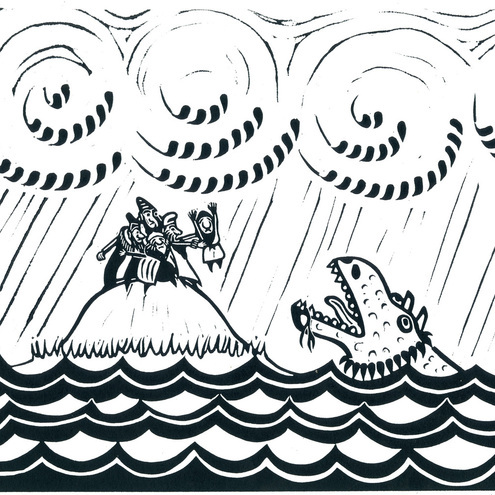 A wonderful archival print of one of Geninne's fantastic illustrations. Printed on acid free 300 grs. Fabriano watercolor paper with an Epson R1800 printer. It has a white border suitable for framing and is signed and dated by the artist. Love it! The Dreaming Spires Willow Playhouse is designed to meet the child's need for imaginative play whilst being an attractive feature in the garden in its own right. The curvy lines and arched windows give the house a fairy tale quality. The twin spires and forked flags swinging gently in the breeze put one in mind of a knight's encampment. Its ambiguous form transforms effortlessly from cottage to castle, wigwam to igloo. 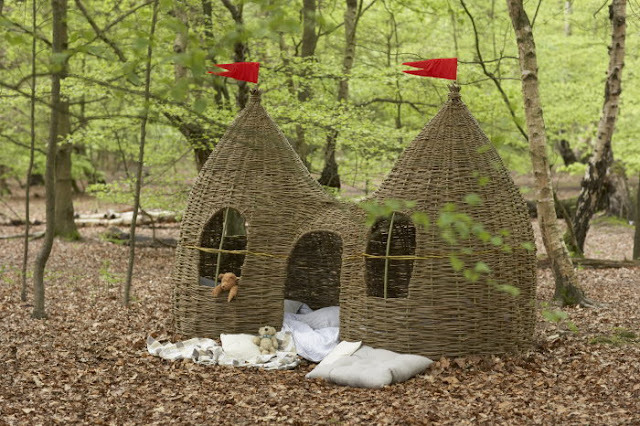 Handmade in England from natural english willow, the playhouse has impeccable environmental credentials. Willow is a material which is annually renewable and which will gradually degrade over about 5 years – which is about the length of time a child will remain interested in using a playhouse. At the end of its life, rather than needing to go into landfill, it can simply be recycled in your own garden. You could use the willow as kindling if you have a fire; you could put it in the compost bin or you could shred it and use it as garden mulch. The base is made from untreated pine. It too will gradually degrade but will be much safer for children to sit on than pressure treated timber. At the end of the playhouse's life, the base timber can be reused for a garden project or converted to firewood. Beautiful! This is a 12.5" x 26.5" giclée print from an original watercolor painting. The central flower is a Lotus surrounded by lotus leaves and Magnolia Grandiflora. Amongst its leaves European bee-eaters get on with the tasks of life. From a limited edition of 50 prints, each is signed and numbered by the artist. Dukkha is a Sanskrit term which usually translated as 'Suffering' although some say it is best translated as 'dis-ease'. The concept is central to Buddhist philosophy and is the first of the four noble truths - 'Life is Suffering', or 'Life is Dukkha'. 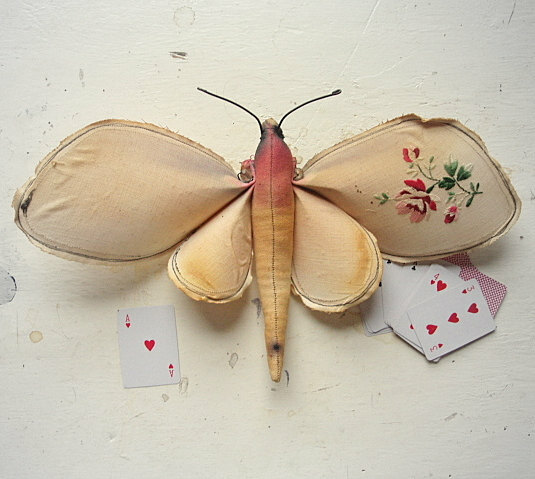 This moth is made from a vintage handkerchief and has beautiful hand embroidered roses on one wing. Designed as a decorative object he is both charming and unique. Flaws and odd stitching are celebrated and are to expected. 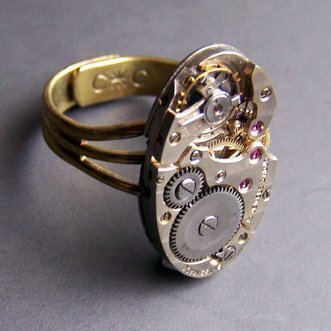 He hangs simply from a ring on the reverse. This moth is 31cm in width and length is 16.5cm (not including antennae!). Mister Finch also creates a fantastic range of creepy crawlies, just click through for more pics. Little Foxes is a beautiful storybook by Louise Crowhurst. 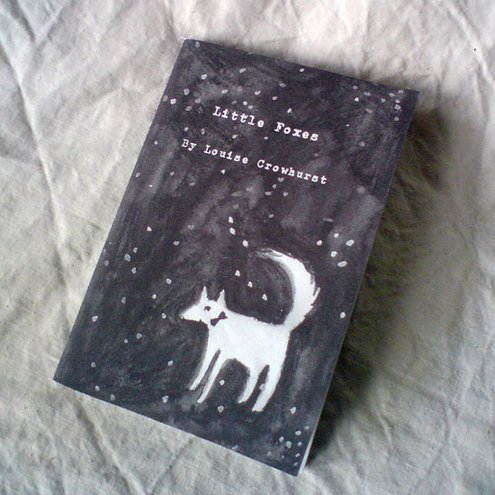 It features two little foxes, one black and one white, who live in a snowy, night-time world and who long to meet. They keep just missing each other, but they never give up hope. Each book is just under A6 size, is printed on cartridge paper and has been stitched by Louise on her own sewing machine. 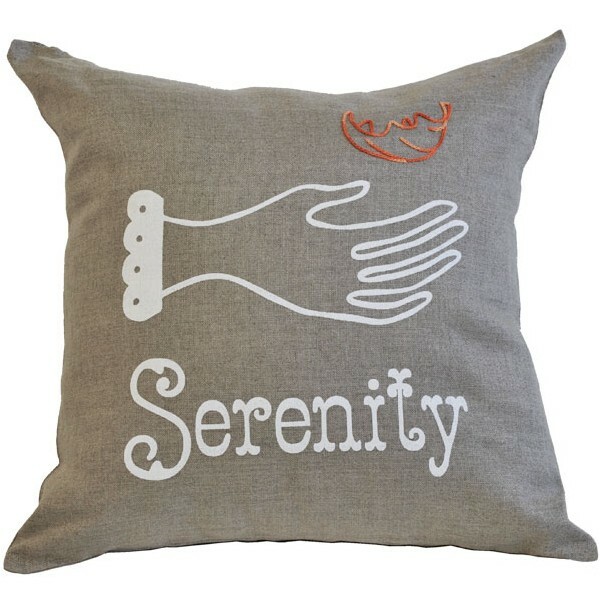 Designed by Emily Peacock for Room39, The Three Graces embroidery cushion kits Gratitude, Serenity and Mercy include a 100% linen cushion cover hand printed with Emily’s original design, colourful variegated cotton thread and needle. Detailed how-to instructions and the outline of the embroidery design already part of the print, make for a perfect introduction to the therapeutic properties of recreational needlework, even for absolute beginners. The Three Graces are a perfect present given as a kit or as finished cushion cover. After all, the most valuable gifts are those we put love and effort into making.